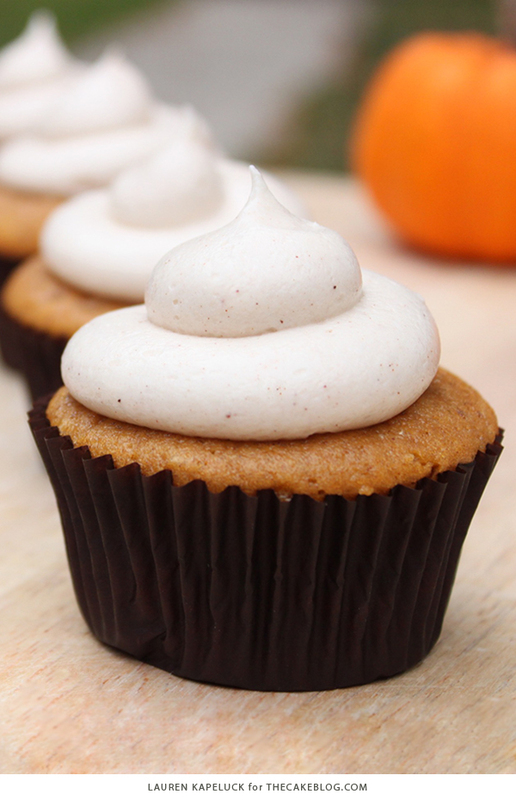 Easy pumpkin cupcakes with cinnamon cream cheese frosting, made from scratch. 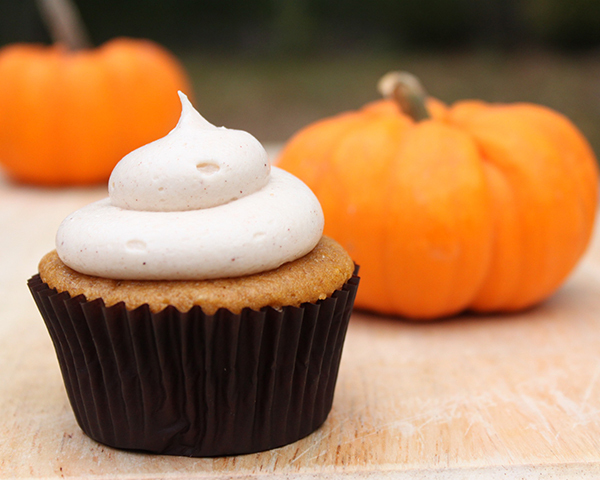 A favorite fall cupcake recipe from our contributor, Lauren Kapeluck of EllenJay Events. This holiday season, why not branch out from the standard pumpkin pie or pumpkin bread and mix up a batch of Pumpkin Cupcakes with Cinnamon Cream Cheese Frosting. During the fall my pantry is always stocked full of pumpkin as my go to ingredient. I have about 12 cans of pumpkin on hand right now! Pumpkin is such a great ingredient that can be used in a variety of dessert recipes, like a pumpkin spice cake or pumpkin tiramisu. But these pumpkin cupcakes are the best and by far a reader favorite! 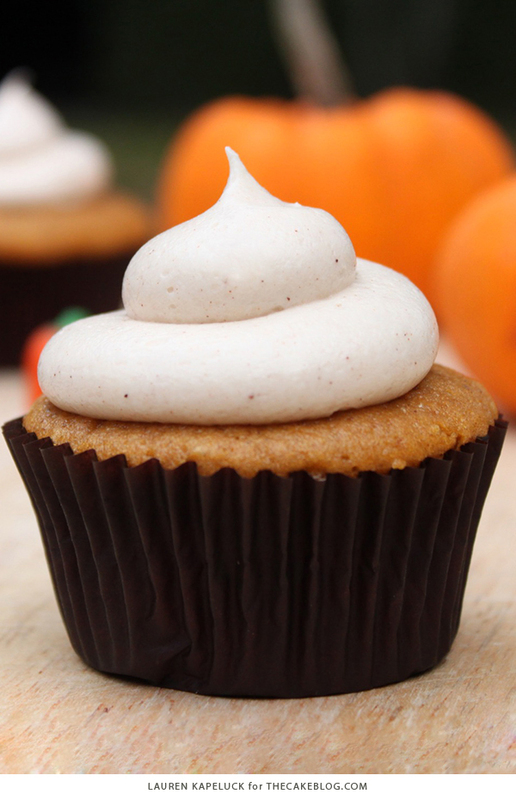 WHAT MAKES THESE PUMPKIN CUPCAKES SO GOOD? 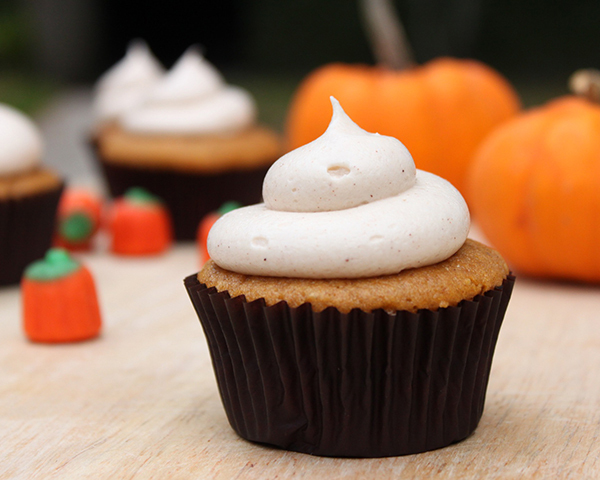 These pumpkin cupcakes are smacked full of fall flavors featuring cinnamon, nutmeg and ginger. 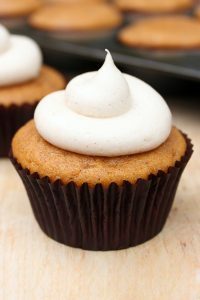 The cupcakes are paired with a cinnamon cream cheese frosting which is the perfect compliment to the cinnamon flavor in the cakes. I guarantee you won’t just be eating one of these at a time. I love how you can see the specs of cinnamon throughout the icing, not to mention the taste is amazing! Can this recipe be made into a cake? Yes it can! This recipe was used as the base for this Pumpkin Spice Cake. Can the canned pumpkin be substituted with fresh pumpkin puree? Yes, you could certainly use homemade pumpkin puree. Here is a great recipe for making it at home. Can these be made in advance? Yes. You can bake the cupcakes in advance and freeze them stored in a ziplock bag. Defrost completely before frosting. Alternatively, you can bake and frost these cupcakes a day in advance, storing the finished cupcake in the refrigerator. How should I store these cupcakes? It’s always best to store any cupcake with cream cheese frosting in the refrigerator. Bring the cupcakes out a 30 minutes before serving – they will taste the best at room temperature. My icing turned out a little bit runny. What should I do? Your icing could have been runny due to the butter and cream cheese being too soft. Simply pop your bowl into the refrigerator to let it chill and set up some before piping onto the cupcakes. Another solution is to add a little bit more confectioners sugar to thicken it to your liking. Can I use a hand mixer instead of a stand mixer? Yes, this recipe will work with a hand mixer. What piping tip did you use for the frosting? A large round tip like a Wilton 1A. How do I convert this recipe to grams? Here is a great resource to help you convert from cups to grams. I don’t like pumpkin. Will I like these cupcakes? Yes, you will! 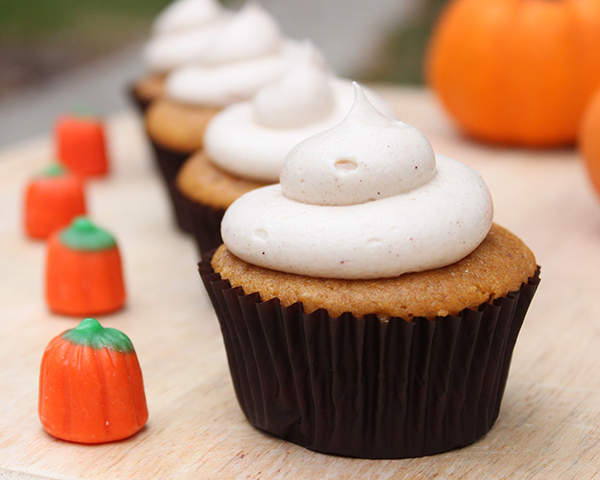 Many people who are not fans of pumpkin still enjoy these pumpkin cupcakes. They offer a great alternative to pumpkin pie and other pumpkin desserts. 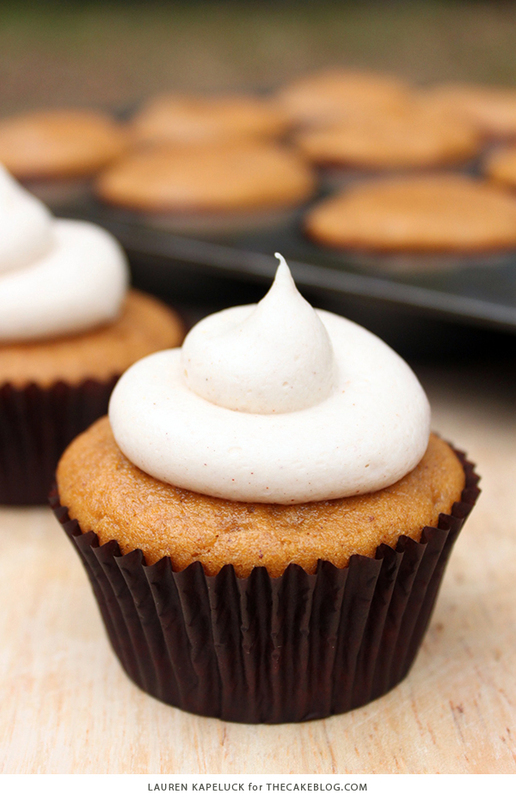 Easy pumpkin cupcakes with cinnamon cream cheese frosting, made from scratch. Once cupcakes are completely cool frost with Cinnamon Cream Cheese icing. In bowl of stand mixer, beat butter and cream cheese on medium speed until well combined. Gradually add in confectioners’ sugar one cup at a time, scraping down sides of bowl as necessary. Add vanilla and cinnamon and mix until combined. Place icing in piping bag fitted with a large round tip and frost cupcakes. I love all of your posts, each morning they are an inspiration for me to bake something new. On Halloween I made a carrot cake with cinnamon cream cheese frosting. I am in love with making these gumpaste flowers.Please check out my site and let me know what you think. These look so tempting!! I love pumpkin and the spices of fall. these look so yummy must give a try!!! For the brown sugar is that the fine packed variety? Light brown or dark brown? Love this idea! Definitely a do for this year’s Thanksgiving!! Must try these for Thanksgiving this year!! I made these cupcakes for everyone the other day and they loved them! I will be making them for Thanksgiving this year and every year after! These were such a hit at Thanksgiving!! Even my hubby that doesn’t really care of pumpkin devoured a ton of them!! I used buttermilk instead of regular milk and they were sooooo moist!!! Definitely making these again!! These look amazing! I’m wondering how much each stick of butter measures? 1 cup? 1/2 cup for each stick? Thanks! These were amazing! I made these for an office carry-in and they were a hit! Many requests for the recipe… I’ll be making these again for sure! Thank you! Would like to try this recipe but don’t have pumpkin in can. 1 1/2 cups pumpkin puree can I make it from fresh pumpkin? If yes, then is cooked or fresh better? I just made these today and they are delicious! Mine took a bit longer to bake, but that could have been because I had multiple pans in the oven. They were soft and delicious, and the icing just makes them. Thank you for sharing this wonderful recipe; it’s a keeper for sure! Love this recipe and want to make this for a halloween weekend but how much are the cups in this recipe? I live in the Netherlands so I have no idea how many gramms a cup is? I just made these cupcakes tonight and they are amazing! My family loved them and they were very impressed! My only question is about the icing? My icing turned out a little bit runny and I was wondering if there is anything I can do to fix that! Your icing could have been runny due to the butter and cream cheese being too soft. Simply pop your bowl into the refrigerator to let it chill and set up some before piping onto the cupcakes. Another solution is to add a little bit more confectioners sugar to thicken it to your liking. Yes! It’s best to store cream cheese frosting in the refrigerator. Just bring them out a few minutes before serving – they will taste the best at room temperature! Made these last night. My entire family loved them! I also linked your recipe on my food blog! I have made these cupcakes 2 x now, and each time the comments were: “Best cupcake I ever ate” “I don’t like pumpkin or cinnamon, but these are amazing” “Very Moist”. These are definitely going in my little black cook book. They are a little work, but well worth the effort. You will NOT be disappointed. Has anyone tried making these using a hand mixer instead of a stand mixer? Also, is pumpkin purée the same thing as canned pumpkin? I’ve had these exact cupcakes (made by a friend) and they’re SUPER YUMMY AND MOIST! And the icing takes the cake!! Yes, a hand mixer would work just fine. And yes, you can use canned pumpkin. Enjoy! I just made these and they are delicious!! I love the pumpkin flavor with the cream cheese. It reminded me of a pumpkin roll dessert. Yummy!! Thank you for the recipe! I am planning to make these for Thanksgiving and I’m wondering how many cupcakes does this recipe make? Thanks! AMAZING! made for thanksgiving my family loved them. …these were DELICIOUS! definitely my best baking feat to date. Everybody loved them (I served them at a thanksgiving party last night). Thanks for the recipe!